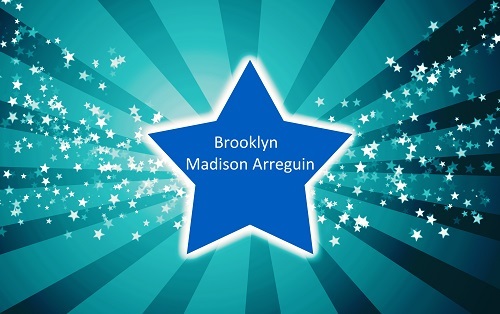 Brooklyn Madison Arreguin is a triple threat performing artist in Southwest Riverside County. Find out more about how Brooklyn Arreguin, age 10, is doing what it takes to get to the next level. For this performing artist, a little sass goes a long way. A. I’ve been training for 5 years. A. I love being on stage. Q. What do you feel makes you unique as a performer? A. My talent and my sassy-ness! Q.What do you do to relax after a performance? Q. How do you psyche yourself up before performing? A. I am just always so excited to get on stage and perform. But I do run all my routines before my performances. A. I love Musical Theatre. Dance is my life, and singing is my passion. A. I won 1st place overall for my Contemporary Solo at Thunderstruck 2014. I also won 2nd place overall for my Hip Hop Solo at Kids Artistic Revue 2014. A. My dream is to perform on Broadway. I will also be going to Medical School. This entry was posted on November 10, 2014 by Ashley Ludwig in City of Temecula, Entertainment, Rising Star, Riverside County and tagged Brooklyn Madison Arreguin, Hip Hop, Hiphop, jazz, Julian Charter School, Miss Amber, Miss Amber Geary and Mr. Sean Thomas Kiralla, Miss Svetlana, Rising Star, Shawna Sarnowski Photography.